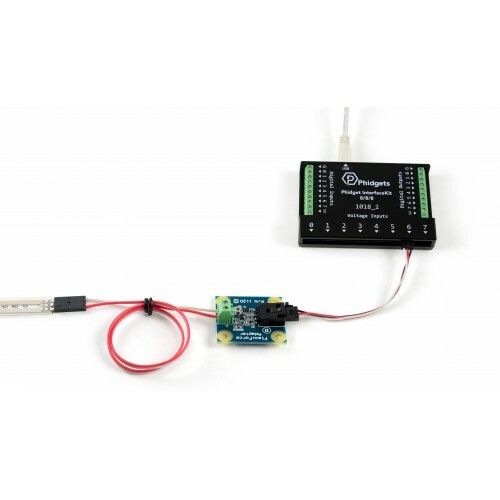 The 1120 FlexiForce Adapter makes it easy to interface a Tekscan FlexiForce force sensor to an Analog Input or VINT Hub Port. This adapter also includes two round plastic discs to help focus the force directly onto the sensing pad. 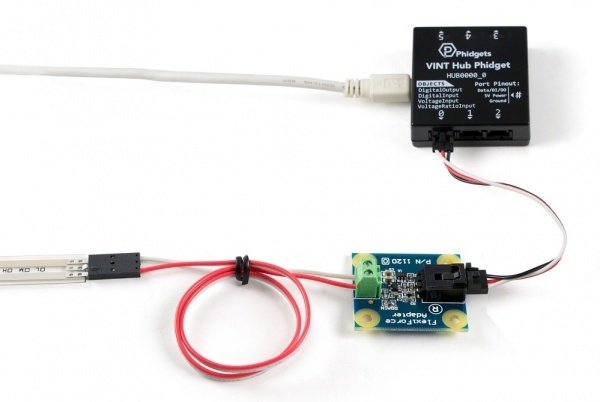 Connect the 1120 to the HUB0000 with the Phidget cable. 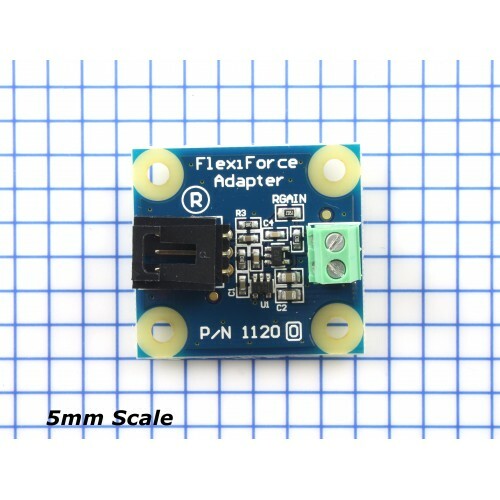 Connect the Flexiforce sensor to the 1120. Polarity doesn't matter. See the technical section for details. Now that you have everything together, let's start using the 1120! 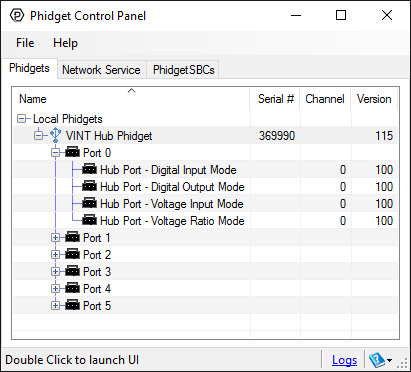 In order to demonstrate the functionality of the 1120, we will connect it to the HUB0000, and then run an example using the Phidget Control Panel on a Windows machine. Linux users can follow the getting started with Linux guide and continue reading here for more information about the 1120. 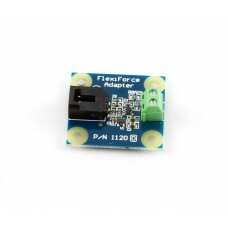 The FlexiForce Force sensor is a piezoresistor that has a very large resistance when it is not loaded (in the range of MegaOhms). The resistance decreases as more force is applied. 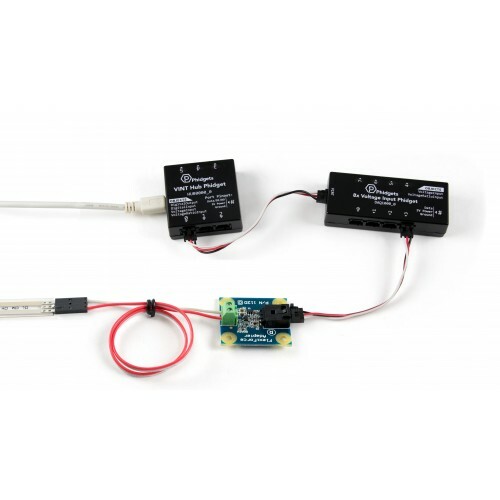 Tekscan offers sensors with standard force ranges, such as 0-1 lbs, 0-25 lbs, and 0-100 lbs. The same adapter board can be used for all three ranges. 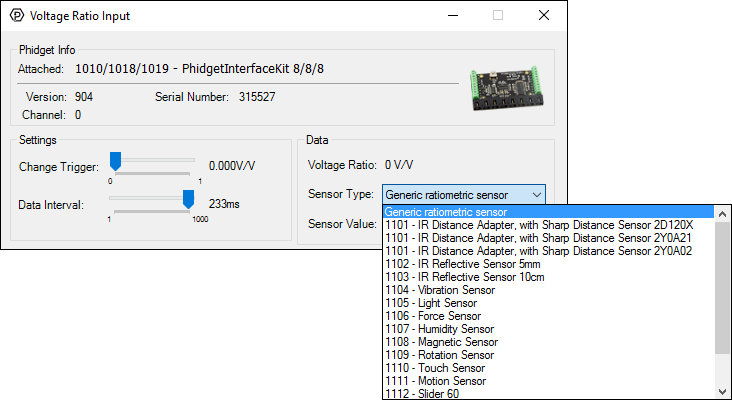 Because the expected part-to-part variance between FlexiForce sensors is as high as 40%, it is imperative that you calibrate your sensor and determine the specific formula which applies to your sensor. For information on how to calibrate your sensor, refer to the FlexiForce User Manual from Tekscan. 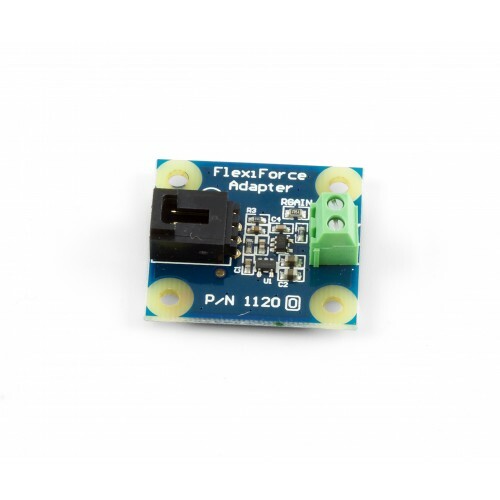 The FlexiForce sensors are easy to interface to the 1120. They can be plugged into the Interface cable that is included. The other end of the cable has been stripped and tinned so that they can be easily inserted into the terminal block. 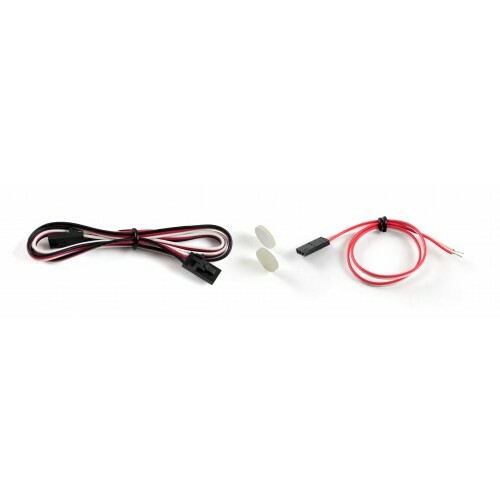 This is useful if a longer cable is needed, as wires can be soldered to the stripped ends. The polarity of the FlexiForce sensors does not matter. 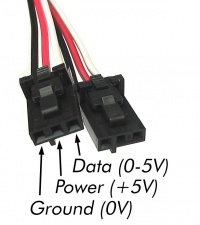 If a larger force range is desired, a resistor on the Adapter board can be replaced. This resistor is designated as RGAIN on the board and has a default value of 15kΩ. When the RGAIN resistor value is reduced, the sensor becomes less sensitive and more force can be applied before saturating the output. Conversely, if the RGAIN value is increased, the sensitivity increases and the output saturates at a lower applied force. If RGAIN is changed, calibration with known forces will have to be done to determine the proper formula. Based on limited testing, RGAIN=5kΩ will give enough range to measure up to 1000 lbs with the 100 lbs Flexiforce sensor. Changing the gain by much larger amounts can cause sensor instability and is not recommended. Also note that adjusting the gain is not a substitute for calibrating and conditioning the sensor. You should look at the manual for the sensor you are using and follow all calibration procedures contained therein before resorting to adjusting the gain value to achieve accurate results. 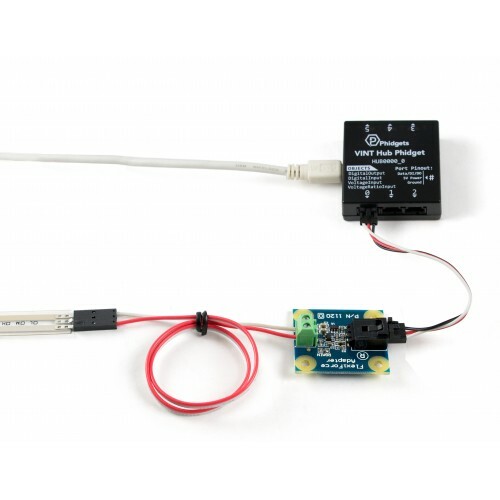 To obtain the most accurate results, it is recommended that the sensor rests on a smooth surface and the object is only on the sensing pad and centered as much as possible. This can be achieved by using a small disc (included) that is just large enough to cover the sensing pad, and then placing the full force on the disc. Without the disc, the object may rest on the surrounding surface and record the force inaccurately. Care must also be taken to avoid jagged or sharp edges on the sensing pad, as it can affect the measurement as well as potentially puncture the pad. The pad at the end of the strip is the only place where force is sensed. Any force along the rest of the strip is ignored. The longer the object rests on the sensing pad, the more the sensor voltage will drift and vary slowly in value. It is very difficult to compensate for the drift since different constant forces will produce different drift rates. For this reason, the average accuracy of this sensor is approximately 5%.